Geologically speaking, we live in a time period of intense climatic change. Since the last 1 million years, our species and our human forebears experienced a dozen or so major glaciations of the northern hemisphere, with the greatest ever occurring around 650,000 years ago. During this period of extreme ice buildup, the ice advanced deep into the Midwest, from its center around Hudson Bay in Canada, and deep into Germany, from its center on the Scandinavian Shield. So much ice collected in these two major regions and several lesser ones that the sea level dropped by some 400 feet and the overall global temperature was lowered by around 5°C (about 9°F). Mammoth, mastodon, wooly rhinoceros, giant bison, camels, horses, and many large predators (cats, wolves, bears) roamed the grasslands well south of the rim of the miles-high ice, both in North America and in Europe. Small bands of humans made a living by hunting and gathering in Africa, and perhaps elsewhere. The glaciation that occurred 650,000 years ago lasted some 50,000 years. It had a profound effect on the landscape, carving great glacial valleys and fjords and lakes, and making moraines and glacial outwash plains around the perimeter of its extent. The greatly lowered sea level allowed rivers to cut deeply into the shelves of the continents and into the edges of the shelves, where the sea floor drops off into the deep ocean. Here canyons could form which would later serve to funnel sediments from the shelf into the deep sea. 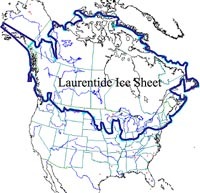 Map of North America showing the extent of the Laurentide Ice Sheet. The blue outline notes the ice sheet�s borders about 15,000 years ago. After this great glaciation, a succession of smaller glaciations has followed, each separated by about 100,000 years from its predecessor, according to changes in the eccentricity of the Earth's orbit (a fact first discovered by the astronomer Johannes Kepler, 1571-1630). These periods of time when large areas of the Earth are covered by ice sheets are called �ice ages.� The last of the ice ages in human experience (often referred to as the Ice Age) reached its maximum roughly 20,000 years ago, and then gave way to warming. Sea level rose in two major steps, one centered near 14,000 years and the other near 11,500 years. However, between these two periods of rapid melting there was a pause in melting and sea level rise, known as the "Younger Dryas" period. During the Younger Dryas the climate system went back into almost fully glacial conditions, after having offered balmy conditions for more than 1000 years. The reasons for these large swings in climate change are not yet well understood. The details of such climate changes were first seen in deep-sea sediments containing the shells of small planktonic organisms called foraminifers. This can be done because when foraminifers are alive, they fix within themselves a ratio of two types of atoms of oxygen. The "normal" oxygen isotope, which is by far the most abundant, has eight protons and eight neutrons in its nucleus; it is called "oxygen-16." The "heavy" oxygen isotope, called �oxygen-18,� has two more neutrons in the nucleus, but has the same number of protons and electrons. Oxygen-16 is found in higher concentrations in snow and ice, while oxygen-18 is enriched in the ocean. Therefore, whenever more water is extracted to make more ice the ocean leaves its �isotopic fingerprint� in the oxygen. This enrichment effect is, in turn, seen in the carbonate shells of the foraminifers (made of CaCO3), because the carbonate precipitates out of the seawater, and the oxygen used to build the carbonate crystals reflects the composition of the seawater. Through this method of analyzing oxygen isotopes in foraminifers, scientists have been able to determine when the Earth has produced more glaciers, and hence determined the times when ice ages have occurred. 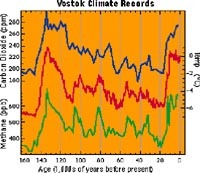 Ice core results from the Vostok drilling site in Antarctica. The top plot in blue is carbon dioxide, the middle plot in red is paleotemperature, and the bottom plot in green is methane. Note how the two greenhouse gases increase with temperature; also notice the recent warming about 20,000 years ago, with the brief dip in temperature during the Younger Dryas. The carbon dioxide content of the atmosphere for the last 4 glacial cycles is known from drilling into the ice in Antarctica, where ancient air has been trapped and now can be extracted. These results show that carbon dioxide follows the change in sea level rather closely: when carbon dioxide increases, sea level rises and vice versa. A similar relationship is seen for methane. Most likely, changes in trace gases help drive sea level up and down, and the changes in sea level in turn change the content of trace gases in the atmosphere in a feedback loop. Some of these climatic changes seem to be extremely rapid.